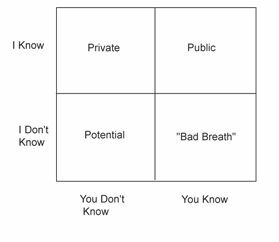 If you hear me teach or train very much, I usually trot out a training tool called the Jo-Hari Window. The tool was designed by two guys named Joe and Harry. It looks like a window pane. Things I know about me that you don’t know. Refer to that as your “private” self. Things I know about me that you know about me. Call that your “public” self. Things you know about me that I don’t know. That’s called your “bad breath” area. You know how it is, the person eats garlic and is making everyone he talks to gag. He just doesn’t know he’s doing it. It’s #3 I would like to talk about, the “bad breath” pane. Frequently, when I get called in to work out a difficult issue, I find the thing that has caused the issue is the thing that everyone thinks, but no one is saying. It takes “courage” to say difficult things. The reason that they don’t get said is that we don’t want to offend. Or, we don’t want to meddle. Or, we don’t believe that the person will do anything about it. Let me tell you what I have learned. It’s the person who will raise the “difficult” thing who causes us to get better. And, if it’s done correctly, that person will be respected and admired by her peers. Recently, I had an experience where someone let me know that something I was doing harmed our interaction. I appreciated the courage. Valued the opinion. Reasoned that he was not the only one who felt that way. Made a personal commitment to change. Takes some courage to tell the CEO he could be more effective. But the CEO is just a guy who wants to be more effective and values the feedback. Is there someone in your life or workplace that could be more effective if he knew what you know? Take your time. Consider how to phrase it. Role play it with someone you trust. And, courageously, communicate.